MS Rep. GEORGE BUSH (R-TX) speaking to crowd at Ross Perot press conference regarding Letter to Hanoi mission while also campaigning for Senate seat. George Bush (George Herbert Walker Bush) says that all Congressmen should take a firm position & contact the leaders of North Vietnam. George HW Bush, without regard to one s own personal position, I think every member of Congress, every United States Senator, every candidate whatever it is, should take a position, a firm out-going, forward position, contact the leaders in Hanoi, contact the other members of Congress and make a united front, united we stand, on this one thing. And I am convinced that it will have the effects that Ross Perot said. And thank you very much for letting me talk. George Bush at Press Conference. Bush is apparently responding to questions about Watergate tape erasures and how he'd rather take the high road and talk about 'fundamentals' of world peace than media-fueled party in-fighting. WS Bush seated alone at table. MS and CU of reporter taking notes. Audio in at 30:47 and a little muddled: "...Uh, the day after there was a breakthrough on the middle east. And I walked into the press conference and that was two days after the tape erasure thing. And they said would you mind commenting on the news, and I said well I think it's great, I really am very pleased, and they said well, what do you mean, and I said don't you think it's marvellous that we're going to have a separation of forces, that for the first time in years that this world may be closer to peace? And they said no not that news (very animated here) tell us about the tape erasure. And I said no I'd rather tell you about this one and I think I'm dealing with much more in the way of fundamentals. You know those guys are dealing more with the headlines of the moment - you know - little things to pit me against the president or the party or some republican, you know everybody is probing around to find somebody who's gonna take a slug at the president, particularly if he's a republican, we'll they're not gonna get me to do that." A young George Bush Sr., during his years as U.S. Ambassador to the U.N., in an informal setting talking about U.S relations with China and Russia. Good shots of Bush before his presidential career. A young George Bush Sr. (George Herbert Walker Bush) talks about Ken Aspromonte, manager of the Cleveland Indians. It is an informal setting where Mr. Bush speaks of "Kenny", but states he does't want to divert too far from world affairs. This is good early footage of the former president. A young George Bush Sr. (George Herbert Walker Bush) stands at a podium and speaks to a small audience of Cleveland City Club members. This is during his years as U.S. Ambassador to the U.N. No Audio. Good medium shot of Mr. Bush at podium with bright red curtain behind him. Audience. Profile view of Bush. Scene change to Bush sitting behind an informal desk with microphones and film cameras pointed at him. A view from behind the desk showing the back of Bush's head and a look at the reporters asking the questions. Cu of Bush, now with audio, speaking of Nixon's trip to Beijing and Moscow. Sen. MARK HATFIELD wishes the Carters and Mondales good health and happiness; audience applauds, unfortunately the camera remains tight on the podium and we do not see the Carters or Mondales. Sen. Hatfield introduces Associate Justice to the U.S. Supreme Court POTTER STEWART to swear in GEORGE BUSH as Vice President of the United States. MS/CUs George Bush taking the oath of office; wife BARBARA BUSH stands with him. At outset, Mr. Bush shakes Mr. Stewart's hand, kisses Barbara on the mouth, waves to audience. President-elect RONALD REAGAN shakes Mr. Bush's hand, kisses Barbara; all resume their seats. COLOR: George Bush, Remarks at the Republican Party Labor Day Picnic in Waukesha, Wisconsin, September 7, 1992. GV President GEORGE BUSH SR. (George Herbert Walker Bush) speaking at rally while on campaign trail, 1992 many people thought Harry Truman would lose in 1948. But he said what was on his mind. He didn't worry about the press. And he never lost faith in the United States of America. And I stand before you with the same passion and that same faith. (1981) Shaky TLS Vice-President GEORGE BUSH (George Herbert Walker Bush) shaking hands with woman at outdoor ceremony. TLS man in black outfit standing on roof, looking through binoculars. TLS George Bush and woman unveiling plaque on wall at ceremony. TLS black limousine with American flags on front quarter panels driving down street. MS Vice-President George Bush speaking at press conference. LS head table at banquet for the Texas and Southwestern Cattle Ranchers. MSs George Bush speaking at banquet. This clip will require additional time and pricing to master. Master 1910 Part 1 CU of George H.W. Bush talking about Texas politics, Lloyd Bentsen, reform issues, personal positivity, etc. Master 1910 Part 2 LS behind the scenes of George Bush Senior interview. MS George H.W. Bush seated on couch. LS behind the scenes of the interview. MS profile cameraman Roy Cooper filming press conference. CU/MS George Herbert Walker Bush stating that he is convinced that no member of the National Republican Committee was ever involved in the Watergate break-in. Master 1909 Part 1 Blurry LS as Richard Nixon exits Air Force One and waves to the crowd. GV press. LS Nixon standing with men on tarmac, one of the men is George Bush Sr. GV back view of press. MS Nixon and entourage (George Bush Sr. is included). Night GV of neon sign for 'Market Hall', it advertises President Nixon's appearance. LS interior of crowd gathered at Market hall for political rally, they clap and wave signs. MS a young George Bush Sr. speaking at podium. GV crowd flashing 'Bush - He can do more' signs. MS Richard Nixon being escorted to podium by George Bush Sr. and Paul Eggers. GV audience. GV Nixon at podium receiving applause and standing ovation. GV crowd. MS Nixon at podium. GV crowd. MS Nixon at podium catering to his constituents that live in Texas and giving his support to George Sr. and Paul Eggers. CU George Bush Senior at podium talking about the problem with drugs, it is not only an issue in the United States but an issue around the world. MS African American man dressed in yellow suit and black tie leaning against wall. CU unidentified man at podium talking about the country's defense budget. 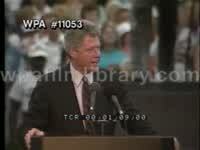 Master 1916 Tape 2 MS a young George Bush Sr. at podium with several microphones in front of him. GV reporters taking notes. MS Bush at podium which reads 'Marriott Dallas'. GV reporters. 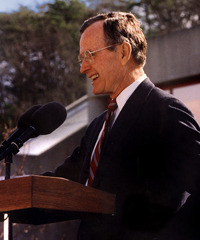 LS Bush at podium. CU microphones. MS Bush talking about political parties and congress. George Bush Remarks at the Republican Party Labor Day Picnic in Waukesha, Wisconsin September 7, 1992. Now, I admit it; Harry and I don't have everything in common. MS George Bush taking to platform at 1992 rally, people waving American flags. MS Bill Clinton shaking hands at rally. MS Sen. TED STEVENS introducing the Bush family and Chief Justice WILLIAM REHNQUIST. MS/CUs of Chief Justice Rehnquist giving the Oath of Office to GEORGE BUSH Sr. (George Herbert Walker Bush) while BARBARA BUSH watches on; swearing in. MS Mr. Bush shaking hands with RONALD REAGAN. TLSs U.S. army artillery firing in ceremonial salute to the new Chief. Sen. WENDELL FORD introduces President GEORGE BUSH while cannons continue firing. Mr. Bush begins Inaugural Address: "There is a man here who has earned a lasting place in our hearts & in our history. President Reagan, on behalf of our Nation, I thank you for the wonderful things that you have done for America. I have just repeated the oath taken by George Washington 200 years ago, & the Bible on which I placed my hand is the Bible on which he placed his. It is right that the memory of Washington be w/ us today b/c he remains the Father of our Country. And he would be gladdened by this day; for today is the concrete expression of a stunning fact: our continuity these 200 years since our government began. We meet on democracy's front porch, a good place to talk as neighbors and as friends. For this is a day when our nation is made whole, when our differences are suspended. And my first act as President is a prayer. I ask you to bow your heads. Heavenly Father, we bow our heads and thank You for Your love. Accept our thanks for the peace that yields this day and the shared faith that makes its continuance likely. Make us strong to do Your work, willing to heed and hear Your will, and write on our hearts these words: "Use power to help people." For we are given power not to advance our own purposes, nor to make a great show in the world, nor a name. There is but one just use of power, and it is to serve people. Help us remember, Lord. Amen." President GEORGE BUSH continues Inaugural Address: "I come before you & assume the Presidency at a moment rich with promise. We live in a peaceful, prosperous time, but we can make it better. For a new breeze is blowing, & a world refreshed by freedom seems reborn; for in man's heart, if not in fact, the day of the dictator is over. The totalitarian era is passing, its old ideas blown away like leaves from an ancient, lifeless tree. Great nations of the world are moving toward democracy through the door to freedom. Men & women of the world move toward free markets through the door to prosperity. The people of the world agitate for free expression and free thought through the door to the moral and intellectual satisfactions that only liberty allows. We know what works: Freedom works. We know what's right: Freedom is right. We know how to secure a more just and prosperous life for man on Earth: through free markets, free speech, free elections, and the exercise of free will unhampered by the state. For the first time in this century, for the first time in perhaps all history, man does not have to invent a system by which to live. We don't have to talk late into the night about which form of government is better. We don't have to wrest justice from the kings. We only have to summon it from within ourselves. We must act on what we know. I take as my guide the hope of a saint: In crucial things, unity; in important things, diversity; in all things, generosity. America today is a proud, free nation, decent and civil, a place we cannot help but love. We know in our hearts that this country has meaning beyond what we see & that our strength is a force for good. But have we changed as a nation even in our time? Are we enthralled with material things, less appreciative of the nobility of work & sacrifice? My friends, we are not the sum of our possessions. They are not the measure of our lives. In our hearts we know what matters. We cannot hope only to leave our children a bigger car, a bigger bank account. We must hope to give them a sense of what it means to be a loyal friend, a loving parent, a citizen who leaves his home, his neighborhood and town better than he found it. What do we want the men and women who work with us to say when we are no longer there? That we were more driven to succeed than anyone around us? Or that we stopped to ask if a sick child had gotten better, and stayed a moment there to trade a word of friendship? No President, no government, can teach us to remember what is best in what we are. But if the man you have chosen to lead this government can help make a difference; if he can celebrate the quieter, deeper successes that are made not of gold & silk, but of better hearts & finer souls; if he can do these things, then he must." President GEORGE BUSH continues Inaugural Address: "America is never wholly herself unless she is engaged in high moral principle. We as a people have such a purpose today. It is to make kinder the face of the Nation & gentler the face of the world. My friends, we have work to do. There are the homeless, lost & roaming. There are the children who have nothing, no love, no normalcy. There are those who cannot free themselves of enslavement to whatever addiction--drugs, welfare, the demoralization that rules the slums. There is crime to be conquered, the rough crime of the streets. There are young women to be helped who are about to become mothers of children they can't care for & might not love. They need our care, our guidance, and our education, though we bless them for choosing life. The old solution was to think that public money alone could end these problems. We have learned that is not so. And in any case, our funds are low. We have a deficit to bring down. We have more will than wallet; but will is what we need. We will make the hard choices, looking at what we have and perhaps allocating it differently, making our decisions based on honest need & prudent safety. And then we will do the wisest thing of all: We will turn to the only resource we have that in times of need always grows, the goodness & the courage of the American people." C/A of Rev. JERRY FALWELL applauding. President GEORGE BUSH continues Inaugural Address: "I am speaking of a new engagement in the lives of others, a new activism, hands-on and involved, that gets the job done. We must bring in the generations, harnessing the unused talent of the elderly and the unfocused energy of the young. For not only leadership is passed from generation to generation, but so is stewardship. And the generation born after World War II has come of age. I have spoken of a thousand points of light, of all the community organizations that are spread like stars throughout the Nation, doing good. We will work hand in hand, encouraging, sometimes leading, sometimes being led, rewarding. We will work on this in the White House, in the Cabinet agencies. I will go to the people and the programs that are the brighter points of light, and I will ask every member of my government to become involved. The old ideas are new again because they are not old, they are timeless: duty, sacrifice, commitment, and a patriotism that finds its expression in taking part and pitching in." President GEORGE BUSH continues Inaugural Address: "We need a new engagement between Executive & Congress. The challenges before us will be thrashed out with the House and Senate. We must bring the Federal budget into balance. And we must ensure that America stands before the world united, strong, at peace, and fiscally sound. We need compromise; we have had dissension. We need harmony; we have had a chorus of discordant voices. For Congress, too, has changed in our time. There has grown a certain divisiveness. We have seen the hard looks and heard the statements in which not each other's ideas are challenged, but each other's motives. And our great parties have too often been far apart & untrusting of each other. It has been this way since Vietnam. That war cleaves us still. But, friends, that war began in earnest a quarter of a century ago; & surely the statute of limitations has been reached. The final lesson of Vietnam is that no great nation can long afford to be sundered by a memory. A new breeze is blowing, and the old bipartisanship must be made new again." C/A shot of House Speaker JIM WRIGHT applauding. Mr. Bush wipes his nose with a handerchief. "To my friends in the loyal opposition, I put out my hand.This is the age of the offered hand. We can't turn back clocks, and I don't want to. When our fathers were young, our differences ended at the water's edge. And we don't wish to turn back time, but when our mothers were young Congress & the Executive were capable of working together to produce a budget on which this nation could live. Let us negotiate soon and hard. But in the end, let us produce. The American people await action. They didn't send us here to bicker. They ask us to rise above the merely partisan. In crucial things, unity and this, my friends, is crucial." CU of BARBARA BUSH listening to her husband speak. President GEORGE BUSH continues Inaugural Speech: "To the world we offer new engagement & a renewed vow: We will stay strong to protect the peace. The offered hand is a reluctant fist. There are today Americans who are held against their will in foreign lands, & Americans who are unaccounted for. Assistance can be shown here & will be long remembered. Good will begets good will." C/A Vice President DAN QUAYLE; sitting behind him appears to be Mr. Bush's mother, Mrs. Prescott Bush. "Great nations like great men must keep their word. When America says something, America means it, whether a treaty or an agreement or a vow made on marble steps." 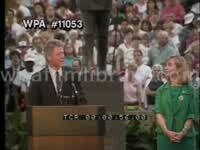 C/A shot of MARILYN QUAYLE and BARBARA BUSH applauding. "We will always try to speak clearly, for candor is a compliment, but subtlety is good & has its place. While keeping our alliances & friendships around the world strong we will continue the new closeness with the Soviet Union, consistent both w/ our security & w/ progress. Hope is good & so are strength & vigilance. Here today are citizens who feel the understandable satisfaction of those who have taken part in democracy & seen their hopes fulfilled. But my thoughts have been turning the past few days to those who would be watching at home, to an older fellow who will throw a salute by himself when the flag goes by, and the women who will tell her sons the words of the battle hymns. I don't mean this to be sentimental. I mean that on days like this we remember we are all part of a continuum, inescapably connected by the ties that bind. Our children are watching in schools throughout our great land. To them I say, thank you for watching democracy's big day. For democracy belongs to us all, and freedom is like a beautiful kite that can go higher & higher w/ the breeze. And to all I say: No matter what your circumstances or where you are, you are part of this day, you are part of the life of our great nation." C/A CU Barbara Bush, GEORGE W. BUSH and LAURA BUSH tending to their kidlings behind her. President GEORGE BUSH continues Inaugural Address: "A President is neither prince nor pope, and I don't seek a window on men's souls. I yearn for a greater tolerance, an easy-goingness about each other's attitudes & way of life. There are few clear areas in which we as a society must rise up united & express our intolerance. The most obvious now is drugs. When that first cocaine was smuggled in on a ship, it may as well have been a deadly bacteria, so much has it hurt the body, the soul of our country. And there is much to be done and to be said, but take my word for it: This scourge will stop." C/A former House Speaker TIP O'NEILL applauding in gallery. "And so, there is much to do; tomorrow the work begins. I do not mistrust the future; I do not fear what is ahead. For our problems are large, but our heart is larger. Our challenges are great, but our will is greater. And if our flaws are endless, God's love is truly boundless. Some see leadership as high drama, and the sound of trumpets calling, and sometimes it is that. But I see history as a book with many pages, and each day we fill a page with acts of hopefulness and meaning. The new breeze blows, a page turns, the story unfolds. And so today a chapter begins, a small & stately story of unity, diversity, & generosity--shared, and written, together. Thank you. God bless you and God bless the United States of America." MSs Mr. Bush shaking hands with DAN QUAYLE, then RONALD REAGAN. MS Mr. Bush and wife BARBARA BUSH-- their son GEORGE W. BUSH and his wife LAUARA BUSH seated and applauding behind them-- stepping to podium and waving to crowd; Mr. Quayle and his wife MARILYN QUAYLE join them. MS RONALD REAGAN and NANCY REAGAN applauding. High angle WLS of crowd. MSs Sen. WENDELL FORD (R-KY) introducing Rev. Billy Graham. MS Rev. BILLY GRAHAM delivering the Inaugural Benediction; CU President GEORGE BUSH saying, "Amen". MSs of U.S. Army Staff Sargeant ALVIE POWELL singing the National Anthem ("Star Spangled Banner"); MS President Bush and BARBARA BUSH singing along, their son GEORGE W. BUSH standing and singing behind them; low angle TLS American flag flying from Capitol Building, Dome in frame; MS RONALD REAGAN and NANCY REAGAN singing along, their hands over their hearts; Stf. Sgt. Powell shakes hands with Mr. Bush & Mr. Reagan. MS President Bush and First Lady Barbara Bush, their son GEORGE W. BUSH and his wife LAURA BUSH standing behind them; Mr. Bush dons coat, shakes hands with Sen. BOB DOLE (R-KS) while Vice President DAN QUAYLE (J. Danforth Quayle) shakes hands with House Speaker JIM WRIGHT. MS of the Bushes and the Quayles leaving the gallery, greeting various dignitaries like former House Speaker TIP O' NEILL.